Not long after their walk up over River Denys Mountain, nine-year-old Duncan MacLeod and his eight-year-old brother Hughie went to church with their uncle Dan and the other MacLeods. 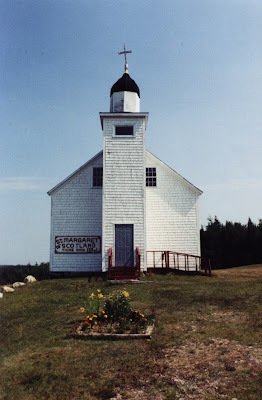 Saint Margaret of Scotland Church had been completed in 1841 and had literally grown with the community: it had actually been split in half one year; the two halves had been pulled slightly apart, and a new section built in the middle. In 1937 the priest only came every two or three weeks, but the church was still the centre of a small but thriving Gaelic community. On Sunday mornings — especially when there was a priest in attendance — all the Catholics in Glencoe squeezed into the church. On this particular Sunday, Duncan and Hughie MacLeod were celebrities. Everyone knew about their walk and their late-night arrival at Dan MacLeod’s house; those who hadn’t heard the story yet soon knew the details, as the priest made sure to tell the whole story to his flock. Children always sat in the small sections that served as a sort of upper floor, but Duncan and Hughie were allowed to sit on the ground floor with their aunts and uncles. They were the darlings of the district. 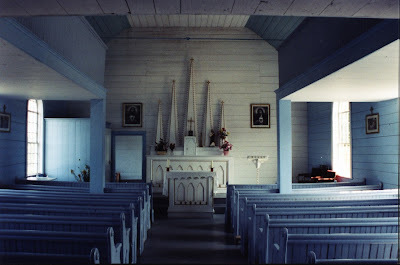 The interior of Saint Margaret of Scotland Church. Duncan and Hughie looked at each other and the colour drained from their well-pinched cheeks. Bears? The MacLeod boys were lucky they hadn’t encountered bears on their trek up the mountain, since the woods in that area were full of them. In fact, there were so many bears in the area, it was only a matter of time before they came across one. Public-domain photo of an American black bear from Wikipedia. One fine summer day — I don’t know if it was the first summer they spent up there or the second — Duncan and Hughie were sitting in a large blueberry barren that was practically right across the MacLeod Settlement Road from their grandparents’ house in Upper Southwest Mabou. They were happily stuffing themselves with blueberries when they looked up and saw a couple of black bears sitting at the opposite edge of the barren, also happily stuffing themselves with blueberries. The boys and the bears eyed one another for a few moments…then they all went back to happily stuffing themselves with blueberries, albeit with a cautious eye on the other diners. On my first trip up to that area in 2001, I had reached a dead end and was slowly driving in reverse down a narrow, bumpy road near the brook just south of the old MacLeod homestead, when something black moved swiftly across the road behind me. I just managed to catch a glimpse of it, more a shadow than anything else, as it flitted out of my field of vision and disappeared into the dense forest. Leen saw the look on my face and asked what was wrong. “I just saw something run into the woods,” I said. Leen’s face went ashen. Bears?